The Azusa woman's club is a beautiful historical site that accommodates up to 250 quests and has been turned into an enchanting Spanish style reception hall. With a high-beamed ceiling, a beautiful hardwood floor, and a charming outdoor patio area this banquet hall makes your function an elegant event. 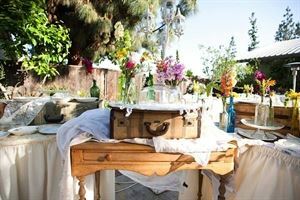 The Bashful Butler takes care of all the preparations including, all hall rental arrangements, beautifully decorated food displays, and brilliantly set tables with linen cloths, napkins, silverware, and glassware.